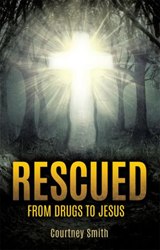 Courtney Smith’s new book, Rescued - From Drugs to Jesus, ($14.99, paperback, 9781498465618) shares her testimony as a young woman growing up in a Christian household to an eventual spiral into drug abuse. Her story is written candidly, as she openly shares her yearning to be loved and accepted. As she grows into her high school years, she begins to recognize a void needing to be filled; as a result, she turns to drugs and grows further away from God. Her downward spiral becomes a source of introspection and purifying spiritual journey, which allows her to reconnect with God and grow from her past. Smith examines the nature of addiction from her personal experience and the testimonies of others to share the factors which can contribute to feelings of loneliness and depression; she shares how prayer and determination to live a Christ-centered life has had a tremendous healing impact on her, and how God can redeem sins. Smith’s emotionally powerful story informs readers on choices, pain, addictions and the nature of love – and will connect to those who have fought addiction, or those looking to understand the nature of love in a clear scope. Courtney Smith experienced several years of drug and alcohol abuse. She had to pull herself up from the bottom of the barrel to where she proudly stands today. It wasn't until she truly surrendered to Christ that she experienced true freedom. This book is testimony to her victory. Xulon Press, a division of Salem Media Group, is the world’s largest Christian self-publisher, with more than 15,000 titles published to date. Retailers may order Rescued - From Drugs to Jesus through Ingram Book Company and/or Spring Arbor Book Distributors. The book is available online through xulonpress.com/bookstore, amazon.com, and barnesandnoble.com.